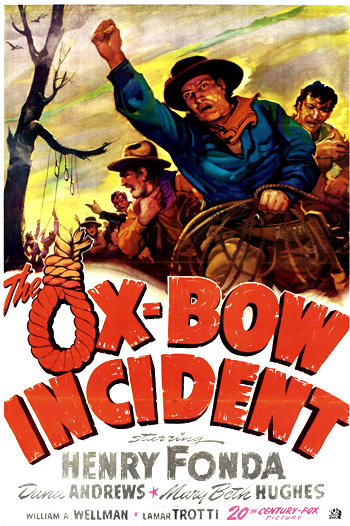 The Ox-Bow Incident (1943) is a grim, low-budget Western masterpiece from director William A. Wellman - based upon the famed novel by Walter Van Tilburg Clark of the same name. Produced and written for the screen by Lamar Trotti, this is an intense, blunt, and downbeat examination of frontier 'justice' with simple characters that represent various philosophical stances, opinions, or attitudes. It is an authoritative indictment of angry mob rule and violence that lead to a brutal lynching of three suspicious outsiders - all innocent of the trumped-up charges. When seen by American audiences in the early 1940s during the progress of World War II, the implication was obvious that Hitler's evils in Europe could also inhabit the ethos of the sacred American/western frontier. In this film, Henry Fonda plays a more passive individual when compared to his portrayal of Juror # 8 in a jury room in 12 Angry Men (1957). Although Fonda was given top billing in the film (see poster to right), he worked for scale and his character role was underplayed within the ensemble cast. The film's making was a labor of love for all involved, and Fonda helped to raise funding for it. Other classic films about lynch mob justice include Fritz Lang's Fury (1936) and They Won't Forget (1937). This film also shares similarities with the Oscar-winning short western film La Rivière du hibou (1962, Fr.) - aka Incident at Owl Creek - its title, its lighting and noirish atmosphere, and its nihilistic theme about the wrongful hanging of an innocent man. Although produced two years earlier than its release date, it was kept out of circulation by the apprehensive studio for two years due to its pessimistic and somber message. The stark anti-Western, neither a war morale-booster or entertainment picture, was critically acclaimed (after it reached its audience through television viewings) for its honest and powerful portrayal and adaptation of the original novel, but it originally failed at the box-office. It received only one Academy Award nomination - for Best Picture (a rarity among Best Picture nominees that usually receive multiple nominations). The dialogue-filled, set-bound picture lacks the action of a typical Western, with pretentious, cautionary, liberal-minded themes and dark, artificially-painted and phony exteriors serving as backdrops. Deader than a Piute's grave. Carter: That guy's awful slow gettin' there. Bartender: I feel sorry for him. Always in reach and never able to do anything about it. Carter: I got a feeling she could do better. It's my guess the married women run her out. Oh, no tar and feathers, no rails, they just righteously made her feel uncomfortable. Not that she ever did anything, but they just couldn't get over bein' afraid she might (he winks). That leaves only five choices or alternatives for entertainment for the single, roving cowpokes in the Western town: "Eat, sleep, drink, play poker, or fight." Or they may "get in line" for the only unmarried woman in town, or shoot pool in the saloon's back room. Darby: Looks happy, don't he? Art: He just needed exercise. Whenever he gets low in spirits or confused in his mind, he doesn't feel right until he's had a fight. It doesn't matter whether he wins or not, he feels fine again afterwards. Down in the SE corner of the valley, about eight miles from his ranch...found him laying in a dry wash in the sun, shot right through the head...about two o'clock, but he must have been shot a lot earlier, 'cause they picked his horse up clear over near the ranch road. Wait, wait, Jeff, there's no rush. Even if they have got a five hour start, it's a good five hundred miles to the first border. Besides, there may be a bunch of 'em. It won't help Kinkaid now to get yourself killed...We're all with you about Kinkaid, you know that, son, only we ought to take our time and form this posse right...Wait a minute, men. Don't let's go off half-cocked and do something we'll be sorry for. We want to act in a reasoned and legitimate manner, not like a lawless mob...You mustn't do this thing. YOU MUST NOT!...If I can make this thing regular, that's all I ask. I say stretch him. It ain't just a rustler we're after. It's a murderer. Larry Kinkaid - one of the finest, most God-fearing men that ever lived, is lying out there right now with a bullet hole in his head. If you let this go by, there won't be nothing safe around here, our cattle, our homes, not even our women folks. I'm with ya, Farnley. I'm gonna get me a gun and some rope and I'll be right back. And if nobody else'll do it, me and you will do it ourselves. I understand how it is, men. My old friend Larry Kinkaid, one of the finest and noblest...Of course, you can't flinch from what you believe to be your duty. But certainly you don't want to act hastily in the same spirit of lawlessness that begot this foul crime....This business is going to be taken care of. I know who's gonna take care of it - me. I tell you now, whoever shot Larry Kinkaid ain't comin' back here for you to fuddle with your lawyer's tricks for six months and then be let off because Davies, or some other whining old woman, claim he ain't bad at heart. Kinkaid didn't have six months to decide if he wanted to die. A posse, more like a self-appointed "lawless lynching mob" with blind hatred, soon forms under the leadership of "Butch" Mapes and stern-faced Major Tetley (Frank Conroy), a pompous, power-hungry, vocal ex-Confederate officer wearing his rebel hat and uniform (who lives in a white-columned mansion at the end of the main street). From information provided by Poncho (Chris-Pin Martin), Tetley informs them that the three bandits fled eastward by Bridger's Pass through the mountains over the old stage road, an 8,000 foot altitude, herding cattle branded with Kinkaid's "mark."